The authors collected in Gendering Global Transformations: Gender, Culture, Race, and Identity probe the effects of global and local forces in reshaping notions of gender, race, class, identity, human rights, and community across Africa and its Diaspora. The essays in this unique collection employ diverse interdisciplinary approaches--drawing from subjects such as history, sociology, religion, anthropology, gender studies, feminist studies--in an effort to centralize gender as a category of analysis in developing critical perspectives in a globalizing world. From this approach come a host of exciting insights and subtle analyses that serve to illuminate the effects of issues such as international migration, globalization, and cultural continuities among diaspora communities on the articulation of women’s agency, community organization, and identity formation at the local and the global level. 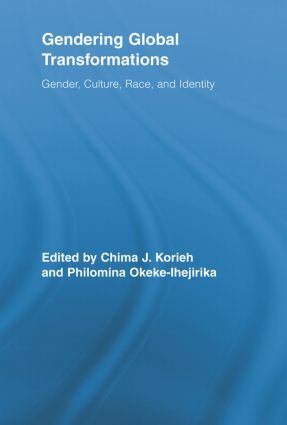 Bringing together the voices of scholars from Africa, Europe and the United States, Gendering Global Transformations: Gender, Culture, Race, and Identity, offers a multi-national and wholly original perspective on the intricacies of life in a globalized era.